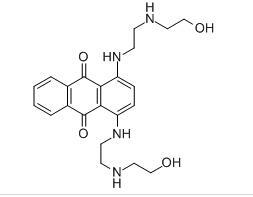 Remarks:Ametantrone is also konw as CI881; NSC196473; NSC 287513; NSC-196473; NSC 287513;is anticancer drug candidate targeting DNA. Ametantrone induces interstrand DNA cross-links in HeLa S3 cells. These cross-links were observed only in cellular system suggesting that metabolism of the drugs is a necessary step leading to DNA cross-linking. Biologically inactive analogue of mitoxantrone, compound NSC 321458, did not induce cross-links in DNA of tumour cells which suggests that DNA cross-linking is associated with the cytotoxic and anti-tumour activity of these compounds.